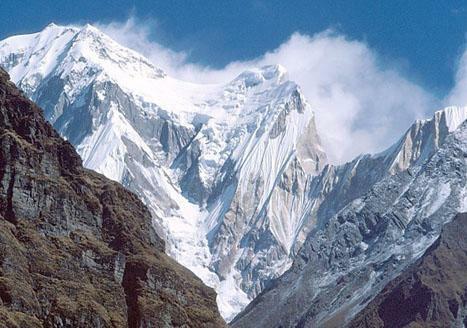 Tamang Heritage trekking and Langtang Valley Trekking can be reached by road from Kathmandu to Dhunche or Sybrobensi, offers an opportunity to explore villages and monasteries as well as glaciers, with magnificent view of the mountains. A permission from the Lamas must be gained before visiting any monasteries and a small donation is expected. The Langtang valley trek is the most visited part of this trek and for those who do not wish to tent camp, accommodation in lodges and meals are available everywhere to sleep and eat. Gosaikunda (frozen lake), an area of high altitude lakes, is reached either from Dhunche or Sundarijol. Thousand of Hindus pilgrims visit these lakes during Jani Purnima festival in the month of August. Believed that this lake have been created by Lord Shiva. Out standing view of Langtang Lerung, Himal Chuli and many more are visible from the trail. Day 01: Pick up from airport and check in Hotel and leisure time. Day 02 : Sightseeing at Pashupatinath, Bhaudhanath and free time for trekking preparation with a trekking guide. Day 03: Kathmandu to Sybrobensi by private vehicle or local jeep or bus. Day 05: Ghatlang to Tatopani 5 hrs. approx 2 hrs step up. 3 hrs flat. Day 06: Tatopani to View Tower than Nagthali 3 hrs ( view poin of Tibetan valley). 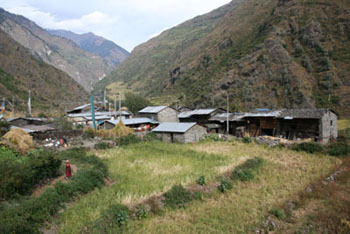 Day 07: Nagthali to Timure village 5 hrs step down. Day 08: Timure village to 1 hr Raswagadi flat walking ( do not take Chinese police pictures at TIBET border) and back to Bridim (visit Tibetan Lama Gomba) 2 hrs step up. Day 09: Bridim to Rimche 6 hrs via Khanjung/ Sherpa gaon hike up. Day 10: Rimche to Langtang valley 6 hrs trek. Day 11: Langtang valley to Kanchengomba 3750 meters, approx 4 hrs hike up. 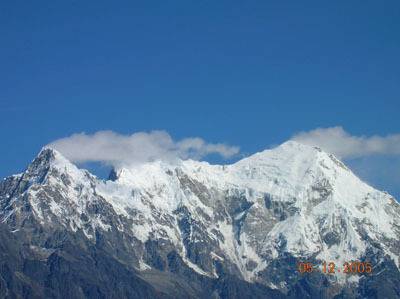 Day 12: Explore Tserkuri Peak 4955 m, if health permit. Night at Kanchengomba. Day 13: Kanchengomba to Rimche. Day 15: Thulosybro to Dunche. Day 16: Dunche to Kathmandu by private vehicle. Do Laundry . Day 17: Sightseeing to Bhaktapur and Kathmandu Durbar Square. Trekking type: Tea house lodges classic trek. All the ground transfer as per itinerary, Kathmandu accommodation (as per your request), sightseeing tour with experience local culture guide, National Park and TIMS permits fees, Tea house lodge accommodation during trek, experienced English speaking trekking guide / leader, necessary two cliens equal 1 experience porter, all program according to itineraries on full board basis while on trekking, wages / insurnace and equipments of local staffs and their all meals, farewell dinner at Nepali typical cultural restaurant. Nepal entry visa, your all meals and drink in Kathmandu including breakfast, clients travel insurance, medical evacuation in case of emergency such as helicopter or extra porter in emergency case, personal expenses, expenses of nature / soft / hard drinks, guide and porters tips, any other unforeseen expenses such as land slide, road block due to rain or strike or political problem your laundry and your communication bill.